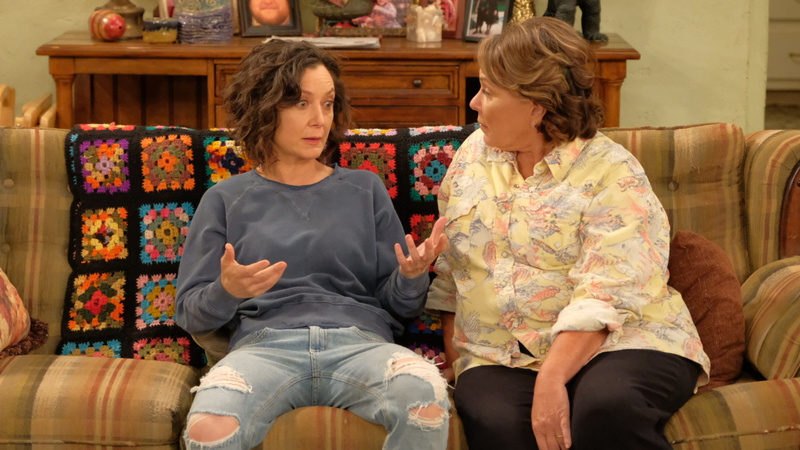 Sara Gilbert and Roseanne Barr in the return of ABC's Roseanne. Gilbert — but not Barr — will re-return in the spin-off The Conners. ABC canceled its lucrative reboot of Roseanne in late May, after star Roseanne Barr published a tweet that compared Valerie Jarrett, a former aide to President Obama, to an ape. ABC Entertainment president Channing Dungey called the tweet "abhorrent, repugnant and inconsistent with our values." It looked like the network was willing to take a financial hit and part with a successful property in the name of, of all things, principle. On Thursday, the network announced that it is picking up the tentatively titled show The Conners. It's a Roseanne-less Roseanne. It went straight to series — meaning it doesn't have to produce a pilot to prove it can work, as other shows would. Instead, it will simply slide into the fall schedule just like it was going to before, except without its star. "Roseanne Barr will have no financial or creative involvement in the new series," according to ABC's press release. One way to look at this development is the way ABC is spinning it, which is that the characters still have plenty of stories to tell. "The Conners' stories demonstrate that families can always find common ground through conversation, laughter and love," says the network. Another is the way Barr herself is spinning it in her own statement, as cited by Lesley Goldberg in The Hollywood Reporter: "I regret the circumstances that have caused me to be removed from Roseanne. I agreed to the settlement in order that 200 jobs of beloved cast and crew could be saved, and I wish the best for everyone involved." But another is that the praise ABC received for doing "the right thing" is having their cake, and continuing to make money from having rebooted the show is eating it, too. ...Barr had agreed in principle to walk away from the characters she helped create in order to allow the cast and crew to pursue a spinoff. But since Barr would be entitled to substantial fees and backend on a Roseanne spinoff, the actress had to waive those rights before a new take could move forward. The last key hurdle was over what, if any, one-time payment Barr was to receive as "go-away money," as one source put it. Barr will retain an executive producer credit on the new take, per WGA rules. If Barr received "go-away money" to make it possible, then she's arguably profiting from the Conners "spin-off," as ABC is calling the star-less vehicle. And she still makes money from the old seasons, which are more valuable the longer all of this is in the spotlight. What's more, if she retains the rights to the character for any future uses (including bringing Roseanne Conner somewhere else), then this is all enormously helpful to her prospects, compared to, say, putting the entire show in a great big bag, setting it on fire and throwing it into a ravine. The bottom line is that Barr is likely to be worse off, certainly, than she would have been if the show had continued with her, but better off than if this new spin-off weren't happening at all. Moreover, this development allows the network, the other actors, and everyone else who stands to profit to avoid reckoning with the choice they originally made. They chose to align themselves with Barr and place their faith in her, despite the fact that nothing about her Jarrett tweet was unexpected, given her history. There is something to be said for expecting people who gamble with a situation like this to swallow their losses. It's not, after all, the responsibility of viewers (or critics) to insure networks or actors against the foreseeable consequences of their actions. Certainly, there are good stories to be mined from working-class people, as we know from One Day At A Time, Superstore, Bob's Burgers, and other currently airing shows. But it's possible to create those stories on sets that don't bear this particular legacy. Shows are canceled all the time, including shows that are much better and more interesting than the Roseanne reboot was. There was a short-lived comedy called Enlisted, about a group of brothers in the U.S. Army, that aired on Fox in 2014. Despite being excellent, funny, well-regarded, and devoted to telling stories about people who are underrepresented on mainstream network TV, it was canceled. Back in the day, the wonderful Freaks and Geeks was canceled, even though it starred Seth Rogen, James Franco, Jason Segel, Martin Starr — even though it was the product of the minds of Judd Apatow and Paul Feig. Cancellations happen. The list of shows that failed for whatever reason or combination of reasons is lengthy, but this is how TV works. Old shows go, and new shows arrive. In fact, old shows must go for new shows to arrive. And every year, shows with enormous potential aren't picked up, because there just isn't very much room on a broadcast schedule. Letting this go wouldn't have been one less show, just one other show. "But," you say, "you fool, you know that networks make decisions for financial reasons. That's the business!" Yes. Exactly. That's the business — where every time you hear that a decision is being made on principle, you should wait for the asterisk. And one more thing, which amounts to speculation informed by experience: If Barr doesn't have additional public issues, wait and see how long it takes for there to be rumors that they might bring Roseanne Barr back to The Conners. Maybe just for a visit. Even if they kill her off, wait and see. Network executives standing on principle come and go, after all. Fictional characters have all the time in the world to wait, and her husband Dan — thanks to a memory-wipe of most of the events of Roseanne's original ending — has already come back from the dead once.